This category contains posts pertaining to PowerShell. On this blog, this will be the vast majority of the posts. Even without a traditional user interface, it is important to separate the presentation layer from the data processing layer. For all of its strengths, Windows PowerShell is not without its fair share of weaknesses. One of the weaknesses in PowerShell that has been with the scripting language since version 1.0 is how it handles formatting. When it comes to formatting data, you have two options: use one of the core Format-* cmdlets (Format-Table, Format-List, Format-Wide, or Format-Custom), or create a format ps1xml file that defines one or more formats for a specific type in an XML document. The former only works for the script consumer, because the core Format-* cmdlets actually convert rich object data into format data, not bearing any resemblance to the original objects with properties and methods that you started with. The latter works for the script author as well as the script consumer, however it is significantly more complicated to implement, and it has its share of limitations as well (for example, once a default format is defined for a type, a script author will not be able to have the results of their script rendered in another format by default without taking some extra steps that shouldn’t be necessary). The end result of these limitations and complications is a formatting system that is not fully leveraged in the majority of PowerShell scripts that are shared among the community. I recently found myself looking at this problem and asking myself one more time if I could do better (it is a problem that I had looked at in the past). The variety of formats that are available is encouraging, and you can generate some pretty useful report-like output when you take the time to leverage the formatting system. But something would have to be done to fix the user experience. The end goal I was envisioning was quite clear: a distinct separation of the presentation layer from the data processing layer such that formatting information would never get in the way of data processing. 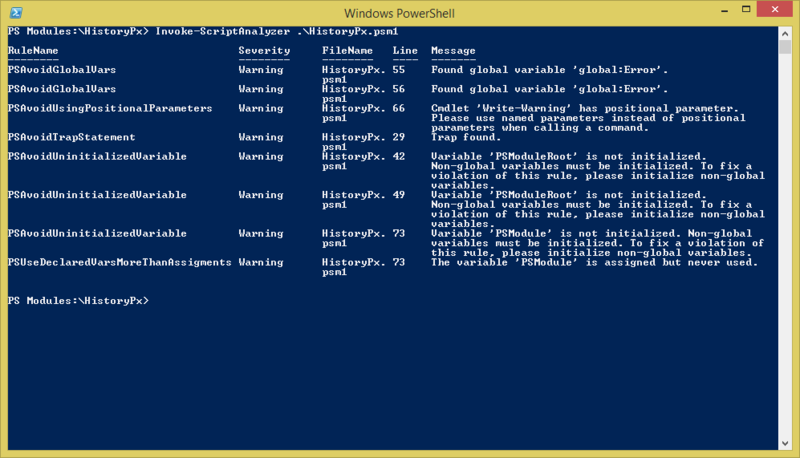 Fortunately, PowerShell is quite well set up for this type of change. Every command that you run has its results sent through the Out-Default cmdlet. Out-Default internally knows what to do with whatever you throw at it, whether that be object data or format data (which really is object data as well, but I’m making a distinction here). When you return an object from a command to the console, if that object is not format data, Out-Default internally will look at the object type, identify the default format for that type, convert the object into format data and then output that format data to the console. If Out-Default does receive format data instead because the object was already converted into format data, it simply renders that format data in the console. Given that is the case, it should be possible to modify the core Format-* cmdlets so that they attach format data to the objects that they format instead of converting object data into format data, and it should also be possible to modify the core Out-Default cmdlet so that it detects format data when it is attached to an object and renders that format data directly to the console instead of looking at the object type to decide what format to use. That, my friends, is exactly what I did. That’s a decent overview of what you get with the FormatPx module – a separation of the formatting layer from the data processing layer, giving you much more control over the presentation of your script results without ps1xml file complexity while still allowing script consumers to view the results in whatever format they like. What do you think? While I don’t believe that is true (I actually find history quite fascinating), it is certainly how I would have responded if asked about history while taking it in high school. I’m not the only one who felt this way back then either. When I asked my wife for her opinion about it, she told me that it was in her history class where she learned to write upside down with her non-dominant hand. My problem with history is the presentation of it. It can be fun and include a lot of contextual detail that is presented with zeal and that connects with the audience; or, like my high school history class, it can be presented as a timeline with boring details attached to it. The problem is, that’s all you get: a timeline with boring details attached to it. The ExecutionStatus property tells me whether a command completed or failed, but the usefulness of that information is very limited because a value of Failed only means the command failed with a terminating error; if a command failed with a non-terminating error, then ExecutionStatus will simply indicate that the command completed, which is not very useful knowledge to have. Start and end execution times are useful, but that means I need to do math to determine how long various commands took, or re-run the commands inside of Measure-Command. There’s no zeal behind the presentation of this information. HistoryPx is an open-source PowerShell module that transparently integrates into the PowerShell environment where it is loaded. You simply load the module by importing it with Import-Module into an environment running PowerShell 3.0 or later, and once it is loaded it will start tracking extended history information for every command you run. Extended history information includes the command duration, whether or not the command was successful, any output returned by the command, and any errors that were added to the $error log by the command. When you invoke Get-History, the new default format for extended history information presents most of these details, or you can pipe the results to Format-List * to get all properties where you can see the core history properties as well as the extended information added by HistoryPx. In addition to providing extended history information in PowerShell, the HistoryPx module includes one other feature that is quite useful. It defines a double-underscore ($__) variable in the global scope that will always contain the output of the last command that was executed. When the last command doesn’t have any output, $__ will be assigned a value of $null. This comes in handy when you invoke a command that takes time to complete but forget to capture the results in a variable. If you want to give this module a try, head on over to the HistoryPx page on GitHub where you can learn how to install or update it in your environment and read additional details provided in the readme file on GitHub. If you are concerned about memory usage with this module, your questions are addressed in the readme as well. This is only the first release of this module, and I am already starting to track features that I want to add to another release. If you do give it a try, please let me know what you think, either in the comments on this blog post or in GitHub, and please log any issues you find on GitHub as well.